Japanese swords come in many different styles and sizes. From the katana to the wakizashi and tanto, it's hard to choose which sword is right for you. The katana sword is the most common and recognizable samurai sword with a curved blade, circular or squared tsuba, and a long, two-handed grip. The wakizashi is typically a shorter sword that when worn with the katana was the official sign of the samurai. Tantos are Japanese knives that could also be paired with a katana, in place of a wakizashi. 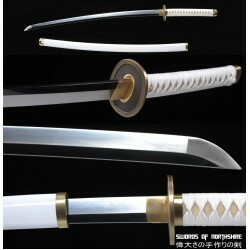 Samurai swords and their different styles are unique re-creations of history, hand forged into a work of art. The process of selecting and choosing your custom sword is one of the most rewarding experiences for sword enthusiasts. A sword is an ode to the Warrior - a time when Samurai and other-battle hardened men and women trusted their sword to be unique and well-made. With hundreds of options, it's easy to get started, add to your sword bag, and have it ready in your hands for battle or as a centerpiece in your home. We use the highest quality materials to craft each unique sword exactly as you want. Dedicated to detail, you can customize every aspect of your katana or ninja sword – from the blade material to the menuki, from the tsuba to the personalized engraving. Let us create your own, custom sword for the warrior at heart. Lovingly dubbed the "Falmessertana" this unique Messer sword is a fully functional, yet af.. 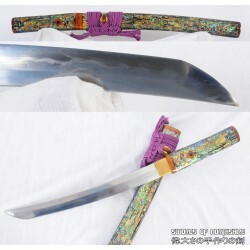 This battle ready dao sword is made of clay tempered & folded high carbon steel with fine hazuya.. The tanto or short sword is a Japanese blade used by the samurai class of feudal Japan. It dates bac.. This is a beautiful blade with a deep koshi sori and shinogi zukuri geometry. The blade is made of d.. 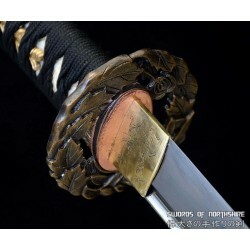 This Katana is made of 9260 Spring Steel which can withstand a high degree of bending and still.. This is a well-made folded steel Katana, made to look just like Roronoa Zoro's Wado Ichimonji S.. This is a well-made and carefully constructed folded steel Katana, made to look just like Roronoa Zo.. This battle ready dao sword is made of folded steel with 8,192 layers and polished painstakingly wit.. The Gladius was a sword popularized by the Legions at the height of the Roman Empire. It is a double.. 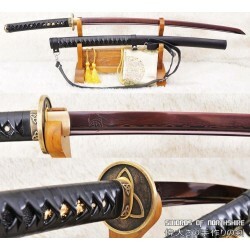 This Samurai Champloo Typhoon Swell Sword is made of 1095 high carbon steel, clay tempered with.. This Nodachi sword is inspired by Sasaki Kojiro's famous Monohoshi Zao Sword, translated in English .. This functional yari spear is made from 1095 high carbon steel with a stainless steel handle. The ya.. This is a well-made folded steel sword, with a design inspired by Michonne's Katana from The Wa.. The Chinese Spear (Qiang) is used in many variations on the pre-modern Chinese battlefield. It is on.. This battle ready Jian sword is made of folded steel, designed to act as a walking cane. The bl.. This is an accurate and fully functional reproduction of a WW2 Gunto Japanese Officer Sword, cl..
Zar'roc was a sword in the Eragon novel and movie. In the novel, Zar'roc was forged by the elven smi..